The newest members of the Blue Eagles Honor Guard perform a mock funeral Oct. 28 at Chapel 1 in front of an audience. The funeral is part of the class’ graduation day. The 412th Force Support Squadron at Edwards Air Force Base, Calif., graduated 27 new members of the Blue Eagles Honor Guard Oct. 28. 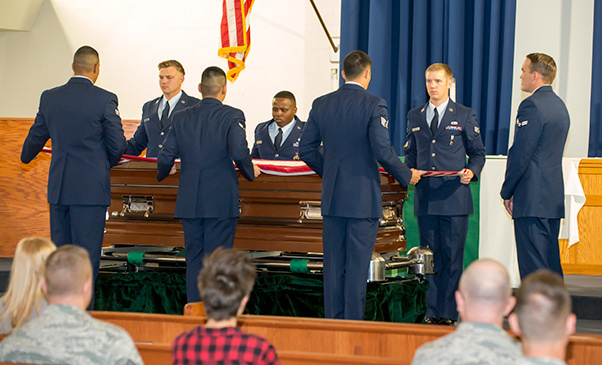 The two-week course culminated at Chapel 1 with the new honor guard members performing a mock funeral with full military honors. The base honor guard’s primary mission is to provide military funeral honors for active duty, retiree and veteran members who served honorably in the United States Air Force and Army Air Corps. The secondary mission of the base honor guard is performing military change of commands, retirements, retreats and other special functions. The Blue Eagles Honor Guard is a total force honor guard comprised of personnel from Edwards, March Air Reserve Base and Los Angeles Air Force Base. Their area of responsibility extends from the Ventura County border to the Arizona and Mexico border, and from the Pacific Ocean to the Nevada border. The honor guard course is taught at Edwards by a staff that includes Tech. Sgt. Jeremy Waldrip, 412th Security Forces Squadron; Tech. Sgt. 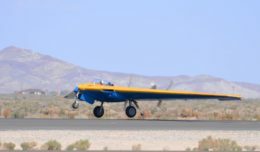 Stephen Pottinger, 31st Test and Evaluation Squadron; Staff Sgt. Stephen Hampton, 452nd Aeromedical Staging Squadron (March Air Reserve Base); Senior Airman Oscar Vega, 412th Maintenance Squadron; and 2nd Lt. Christopher Arnold, 771st Test Squadron. To learn more about the Blue Eagles Honor Guard, or to join, call 661-275-2583 (BLUE) or e-mail edwardsfss.honor.guard@edwards.af.mil.